At Gramercy Dental Studio, we partner with patients to keep their smiles healthy for life, but even the best in-office and at-home hygiene routine may not be able to prevent all dental damage or decay. Our skilled dentists can also provide a variety of restorative dentistry services to protect remaining tooth structure and repair function, including dental crowns and fixed bridges. Our goal is always to use the most conservative restoration options, while still fully repairing your smile. If you’re in need of dental restoration, call our Gramercy Park dental office. We’ll schedule an appointment to see you as soon as possible. Custom crafted dental crowns are a commonly used restorative dentistry treatment. 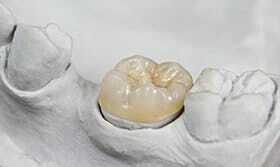 They fit completely over the top of a tooth, recreating and perfecting tooth structures. Fixed bridges are tooth replacement prosthetics used to replace one or a few consecutive missing teeth. The replacement teeth, called pontics, are fused to two dental crowns, one at each end. These crowns are attached to healthy teeth on either side of the missing teeth to support the fixed bridge prosthetic. Whether you need a dental crown or fixed bridge restoration, you’ll need to plan for two treatment appointments in our office. During the initial appointment, we prepare your tooth or teeth by removing a small amount of tooth structure all the way around the tooth to allow the crowns to fit into the natural smile line. 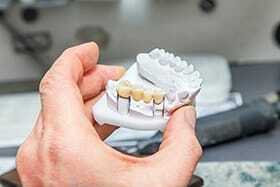 Then, we capture impressions that are used by dental labs to create your custom dental crown or bridge. Before you leave the first appointment, we craft and place temporary crowns or bridges that will be used to protect your smile until the final restoration arrives from the lab. When we receive the final dental crown or bridge, you’ll return for the second treatment appointment. This shorter office visit is simply to remove your temporary and replace it with the flawless, custom dental crown or fixed bridge to recreate your smile. For the most part, you can continue to brush and floss as usual. You may want to make some changes to the oral hygiene products you use. Some toothpastes are very abrasive. This is especially true of those toothpastes that contain whitening agents. Our team members can help you to find the best products to avoid wearing down your porcelain dental crown or bridge. During your six month dental exams and teeth cleanings, we’ll walk you through best practices in at-home care to keep your smile whole and healthy.